"Good view , good location"
Have a question for Chandra Varin Riverfront? "By the way, breakfast by the Mekong river in the morning was..."
When visiting Chiangkhan, you'll feel right at home at Chandra Varin Riverfront, which offers quality accommodation and great service. The city center is merely 0 KM away and the airport can be reached within 50 minutes. With its convenient location, the hotel offers easy access to the city's must-see destinations. At Chandra Varin Riverfront, the excellent service and superior facilities make for an unforgettable stay. The hotel provides 24-hour security, daily housekeeping, taxi service, restaurant to ensure our guests the greatest comfort. In addition, all guestrooms feature a variety of comforts. Many rooms even provide television LCD/plasma screen, complimentary instant coffee, mirror, towels, internet access – wireless (complimentary) to please the most discerning guest. Besides, the hotel's host of recreational offerings ensures you have plenty to do during your stay. Whatever your purpose of visit, Chandra Varin Riverfront is an excellent choice for your stay in Chiangkhan. "it was also very clean and full facilities." There is no clear entryway to the Hotel. The passage is through a restaurant. The caretaker of the property has to be called from another location to open the riverfront property for travelers. The room is too small to accommodate a family. Not a pleasant experience. We're very happy about the size of the room, it was huge! and it was also very clean and full facilities. One little problem that occurred was the parking place for our car. We had to park our car at the other guesthouse which owned by the same owner and walked to this hotel, the walking distance was 1/4 of a mile but if you traveled there with a car then make you have available parking space because there were not many space there for parking. By the way, breakfast by the Mekong river in the morning was awesome! The bedding was old and musty smelling. No fridge. Cheap free water - of low quality. Towels were old. Lights that didn’t work were not fixed. Manager who didn’t know I speak Thai said foreigners are fussy and stupid. 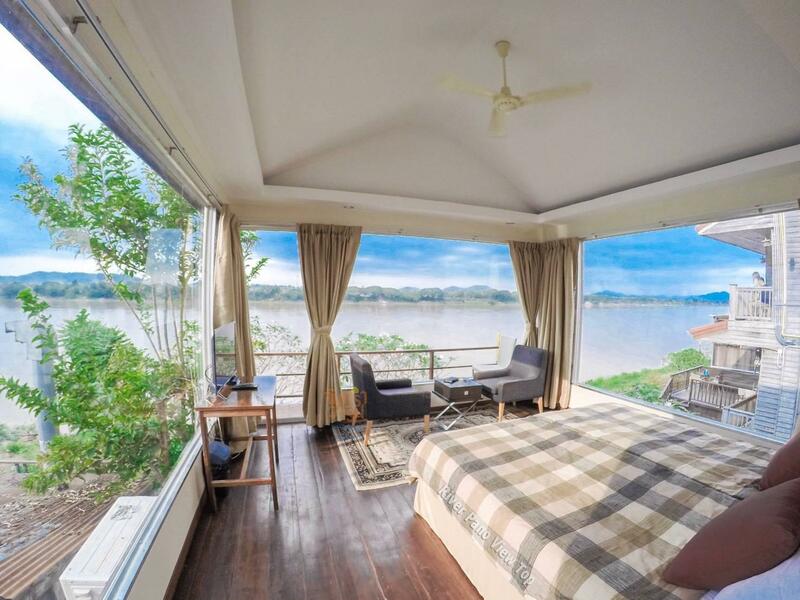 Spend the extra for room 1 with a private balcony and wonderful river views. I stayed in an interior room the night before and, while it was a nice room, it wasn’t anywhere near as nice as room 1. Room with a fantastic view. Simple breakfast is provided at eating house just below the room. Located right in the midst of Chai Kong walking street. The room was too small when you compare to the price. No parking area. Downstairs was very noisy. Never come back again.